Picasso, the first from left. Botero (foto de roel1943), the first from right. Sihanoukville, Cambodia – ColPas. The Culture Correspondent of BBC Newsnight, Stephen Smith, called the Colombian artist Fernando Botero the “Picasso of South America” in a program that was released in April 5, 2007 and retransmitted on December 29, 2007 as the best BBC production of the year. “Like his fellow countryman, the novelist Gabriel García Márquez, Botero’s vision is nostalgic and sensual, revisiting the rustic Colombia of his youth, her fly-blown cantinas, he tumultuous bordellos”, said Smith. The Mona Liza of Botero which background reflects the South American views. One of the most wealthy men of the world due to his art, his works are sold for up to $2 m each and are acquired by many kind of peoples around the world, as his donations of pieces of monumental bronzes for parks and streets of important cities like Paris, Rome or the ones of his own country, Colombia. Only Medellín, his born place, hold a park dedicated to him with the bronze statues of his characteristic style, as many works in the Antioquia’s Museo. Bogotá, Cartagena de Indias and other Colombian cities keep also the prints of one of the most world important artists of the present time. 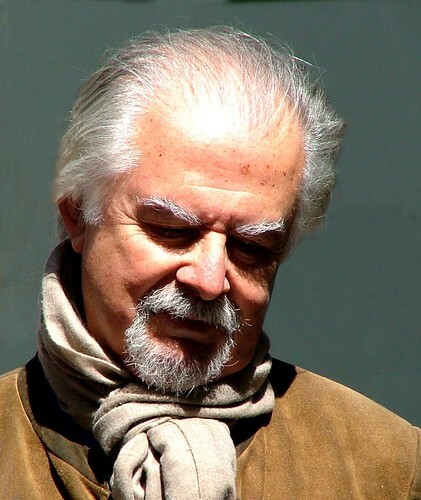 Fernando Botero was born in Medellín on 19th April 1932. The city is also one of the most important centers of Fiesta Brava in Colombia (toros) and young Botero was inscribed by his uncle to a school of toros, one of his favorite subjects in his art works. His first exposition was celebrated in Medellín in 1948 and since then he began a successful carrier working first as an illustrator in El Colombiano newspaper. In Bogotá he came in contact with the most important intellectual and artists of Colombia and got his first national prize in the 9th Colombian Art Exposition. The success in Bogotá opened to him the doors of Europe and he went to Barcelona in 1952. He inscribed in San Fernando Academy of Art of Madrid where he studied the Spaniard methods. In 1953 Botero is found in Paris to get in touch with the French history of art and finally he moved to Florence to know the Italian Renaissance. Back to Colombia in 1955, his artist proposals were not welcome in a time when the country was influenced by the French vanguard. Married with Gloria Zea, he moved then to Mexico in 1956 and a year after he did an exposition in New York. Back again to Bogotá he was nominated director of the Fine Art School of the National University of Colombia and won the second national prize of the 10th Colombian Artists Exposition. It was followed by a successful exposition in Washington were he sold all his works the same day of the inauguration. Botero started a long successful carrier from country to country becoming very popular and his work very characteristic: USA, Mexico, France, Italy, Spain, Colombia, Germany, Montecarlo. Russia, Venezuela and his works exhibited permanently in the most famous avenues of the world: Champs- Elysees in Paris, Grand Avenue in New York, Paseo de Recoletes in Madrid, Plaza del Comercio in Lisbon, Piazza della Signoria in Florence and in the Pyramids of El Cairo. “The President of France once ordered that monumental bronze Boteros should parade down the Champs-Elysees. But some critics claims that Botero’s work, elephantine and above all expensive, amounts to “art for people who don’t care about art.”, said Smith. Escultura de Botero en el Parque San Antonio de Medellín. Foto de Janeth Charris. Even critics or admirations, Botero is considered the most important living artist of the moment and he has donated his work also to several places, first his own Colombia. The first donation was done to his city in 1976 to the Antioquia Museum and many other donations came to that same center. In 1984 he donated to the National Library of Bogotá some paintings. In 1992 he donated a sculpture to Santiago de Chile located in front to the Contemporary Art Museum in the Forestal Park. The biggest donation was again to Medellin with 114 paintings, 23 sculptures of international artists of his personal collection. Such donation did that the city created the famous Botero Park in front to the Cultural Palace just in Medellin downtown. Other countries have permanent exposition like the Wallraf-Richartz Museum in Nuremberg, Germany, the one of the Thays Park in Buenos Aires, the Moderne Kunst in Vienna, Austria, the Modern Art Museum of Bogotá, the Ho-am Museum in Seoul, South Korea, the Smithsonian Institute of Washington, the Art Lowe of the University of Miami, the Coral Gables of Florida, the Museum of the University of Rochester, the Art Metropolitan of New York, the Art of Milwaukee, the MoMa of New York and many others in that city, the Museum of Israel, the Modern Art Museum of the Vatican City, the Contemporary Art Museum of Hiroshima and many others in Japan, the Art Ponce Museum of San Juan of Puerto Rico, the Pushkin Museum of Moscow, the hermitage in Saint Petersburg, the Lausana Olympic Museum of Switzerland and the Museum of Fine Arts of Caracas.